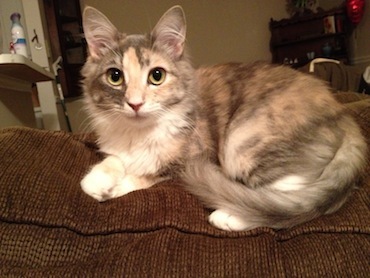 Meet this gorgeous girl, Emily’s Sophie, a soon-to-be one-year-old who has mild to moderate cerebellar hypoplasia. I absolutely love how Emily describes Sophie’s abilities, and I think most of us may see parallels between Sophie and her abilities and habits and our cats’! She can’t jump onto our bed because it’s too high, so when she wants up she sits at the side of the bed and chirps at us to let us know she’s there. As soon as she’s up, she climbs between our heads and starts purring – she has the LOUDEST purr I’ve ever heard from a cat! Haha! Our couches are lower to the ground though, so she is able to climb up onto those. Her favorite spot is on the back of the couch, so she scrambles up the couch to get there. She tries to jump her way up there sometimes – when she jumps, it looks so different from any cat jump I’ve ever seen. She goes from a regular standing position straight up in the air, like she’s on a trampoline or something! When she does this, she doesn’t have much control over where she lands, so she misses her target from time to time. But she always finds her way eventually! She does pretty well with the litter box. She falls over in it every now and then and gets dirty, so my husband and I have become pro cat bathers. If we hear her in the box, we will rush in there to hold her up. We also have a homemade litter box – when she kicks litter, the higher walls of the storage bin help to contain the mess. As for eating, she doesn’t really have any trouble at all. She pecks at it a bit, but not bad enough to prevent her from being able to eat. We have specific feeding times for the cats rather than allowing them to free feed, and our other two cats have always raced each other as they eat so they can try to eat the other’s food. We had to separate Sophie from the other two at meal times in the beginning because she was a much slower eater, but she has almost caught up to Sampson and Delilah! Sophie seems to have a strong interest in the outdoors. She will stand underneath the windows of our apartment and chirp and meow until one of us opens the blinds for her to see out. One day as I was leaving for work, I opened the front door to our apartment and Sophie darted out faster than I could stop her. She ran full force through the breezeway right toward the stairs leading down. We don’t have any stairs in our apartment, so I don’t know if she can or can’t climb them. And I wasn’t about to find out this way! My husband and I both chased after her, afraid of what might happen if she didn’t stop herself in time. She ran as fast as she could (which is surprisingly fast! ), but then stopped herself right at the top of the stairs – she noticed that the ground was about to drop off in front of her. We were terrified in that moment, but looking back on it, we can laugh about it now. We know now to be extra careful when coming in and out of the apartment – Sophie is always there waiting! Because she seems to be so interested in the outside, we have taken her out on adventures! 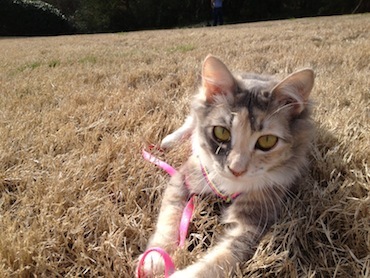 We have a couple of cat harnesses and leashes, so we strapped her in and took her outside one afternoon. She loved it! She just rolled around in the grass and chased leaves and had the best time. Surprisingly, no. I’m always nervous she is going to hurt herself when she jumps off the furniture. She is so haphazard about the way she jumps down, I worry that she will hurt her leg or hit her head or something. If I notice she is about to take one of her crazy leaps, I will try to grab her to set her down on the floor, but she usually always jumps before I can get to her. She jumps, has her crash landing, and doesn’t seem to notice or mind – she just keeps right on going! Each animal is special in his/her own way. How is he/she special? Sophie is the only cat I have ever known who seems to be happy ALL the time. Our other two cats are happy a lot, but they will get irritated or annoyed at stuff and sometimes each other, the way most cats do. Nothing seems to bother Sophie. She is always in a happy-go-lucky mood – eyes lit up and a “smile” on her face. She doesn’t seem to have a care in the world. It is contagious. You can’t help but smile and laugh when she is around. Have you found ways to help him/her with CH? How? We always try to follow the “four-on-the-floor” rule. It seems to help her a lot! Be patient. When we first adopted Sophie, I got frustrated with her CH a few times – I even had thoughts like, “What have I gotten myself in to?” and “Am I in over my head?” It just takes time to get adjusted and to figure out the different ways that a CH kitty might need extra help. I have gotten so used to Sophie and her ways, that it doesn’t seem like a big deal anymore. I don’t even see her CH as a disorder – it is just part of who she is. And I wouldn’t change a single thing! After hearing from Sophie’s foster mom that she was advised to put her down because of her CH, I was horrified. I did some research and reading online and discovered that that is a common way of thinking about CH cats! They get put down so often because people think there is something wrong with them, that they couldn’t possibly live a happy life. But that is just not true. People need to educate themselves about CH and spend some time with CH cats – if they did, they would see that they can live a perfectly happy life, despite their CH. They can be some of the sweetest, most playful, and happiest cats there are! My favorite thing about Sophie having CH is her personality – I think that without her CH, her personality would not be the same. My least favorite thing is how she sometimes falls over in the litter box and gets messy. But that is a small price to pay for having her! ← Spread Awareness, Save Lives! Great story about Sophie, she sounds like a great cat! She’s lucky to have you two cat parents.